Back in the day, Napa was just the ho-hum city you drove through to get to the real Napa Valley. Those days are long gone. The city of Napa is now one of the liveliest, most cutting-edge spots in the whole valley, with a long list of hot new hotels, restaurants, tasting rooms, and other activities. Plus it’s the only local town with real access to the Napa River, which lends another whole perspective to the wine country experience. Anchored at the southern end of the valley, Napa is the area’s largest town, with a population of about 80,000. It incorporated as a city in 1872, and there are still many fine examples of late-nineteenth and early-twentieth-century architecture. Its riverfront promenade has been beautifully developed in recent years – a welcome addition to the downtown area’s lively arts and food scene. Both the Oxbow Public Market and the station for the fabled Wine Train are nearby. Stay. From small boutique B&Bs to larger resorts, the Westin Verasa Napa, Napa River Inn, River Terrace Inn, and Andaz Napa are just a few of our favorite downtown hotels, and there are many more around town and heading up the valley. See more hotel options here. Eat. From an early morning breakfast to an after-hours snack, Napa has plenty of cafes, restaurants, bars, and take-out joints to please every palate. 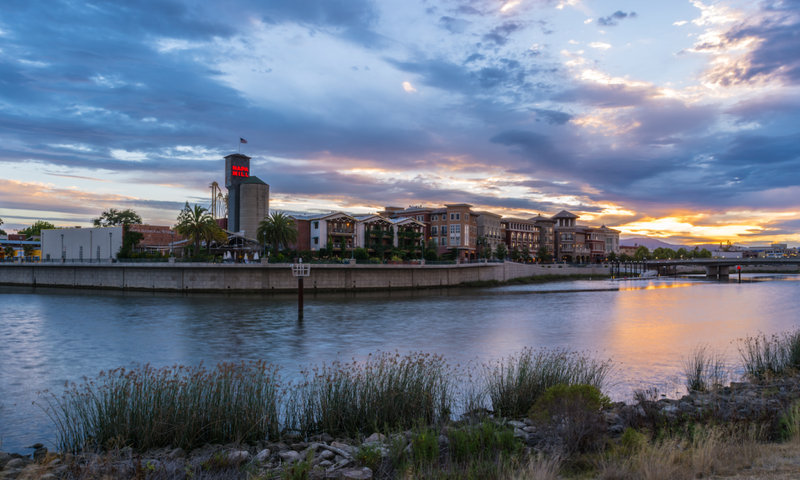 Oxbow Public Market and the Napa Riverfront are two great places with lots of choices in one central location. The Michelin-starred La Toque features new French cuisine in a white-tablecloth setting. Heritage Eats is a fun new “world food” eatery at the Bel Aire Plaza. Morimoto serves creative Japanese fare with a wide selection of sakes. And Zuzu offers Spanish tapas in a lively atmosphere. You can find more dining options here. Taste. Downtown Napa is filled with good tasting rooms – try John Anthony, Back Room Wines, Vermeil Wines, or Prime Cellars. Or head to the Crusher Wine District south of town for a neighborhood of young, edgier wineries. If you’re in the mood for something other than wine, check out Napa Valley Distillery or Napa Smith Brewery. More tasting options can be found here. Play. Where to begin? You could get on a kayak or paddleboard and see the town from the Napa River. Take a “Foodies on Foot” tour to sample bites from bakeries and restaurants all over town. Follow the local Art Walk, an al fresco art museum. Or book a walking tour to learn about the city’s colorful history. The Riverfront and streets around Main and First also offer some excellent shopping. You could easily spend two or three days just exploring Napa before you even venture north into the valley. Don’t overlook the city itself!